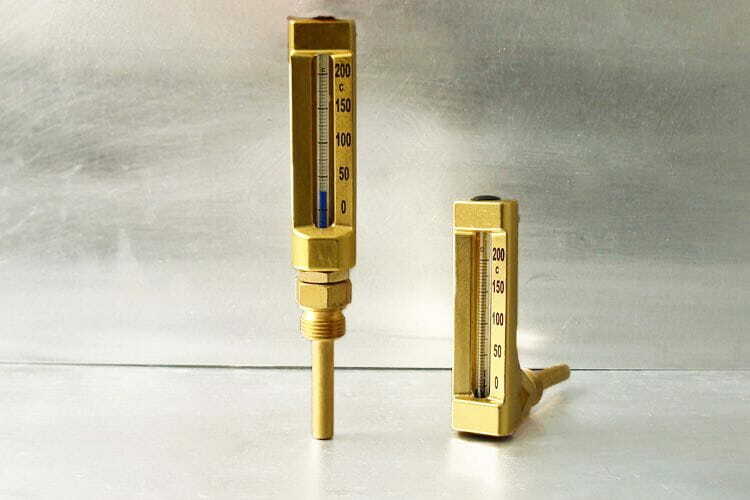 These industrial thermometers are based on the dilatation principle. The liquid (generally alcohol) or mercury changes its volume displacing inside a marked prismatic capillary glass when temperature changes. The glass is protected inside a gold coloured anodised aluminium case. Bigger-sized cylindrical cases are available in brass and stainless steel for easier reading. The V-shaped thermometers are suitable for industrial applications, as well as marine and air-conditioning installations. Available ranges from -60°C up to 650°C according to DIN 16181/ DIN 16195.